Julie* had just moved into a new area and was looking for a medical team that was close to home. After seeing her doctor and having a review of her current medical condition, Julie* was recommended to find a Physio to help her deal with a long history of knee pain and arthritis. Julie* came to see us with her X-rays which showed some significant arthritic joint change in her left knee, this was no surprise as she had a right knee replacement two years prior to this. She was also keen to stay mobile and came to see us with the aim of reducing the pain and remaining mobile for as long as possible. Julie’s* pain came on at the end of the day after weight bearing activities like walking. She had learnt how to manage her day-to-day jobs at home and in the garden so that she could still do everything she needed to do. The Physio started Julie* off on a short home program of stretches and strengthening exercises for both knees and then booked her into a hydrotherapy program. She had two one on one sessions with the Physio in the pool, where she was taken through her program. This included specific exercises aimed at improving her range of movement and strength in her lower limbs as well as other joints in her body. Using the buoyancy and resistance of water the exercises worked all the major muscle groups from the abdominal core to the muscles around the hips, knees and ankles. They incorporated balance exercises to help prevent falls and light aerobic exercises to work out the heart and lungs. The beauty of water is that resistance is controlled through speed of movements, so Julie* is able to pace herself depending on how she is feeling on the day. 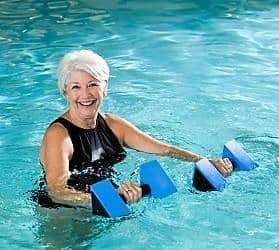 Without the jarring of land-based exercise Julie* is continuing the hydrotherapy program in the pool and keeping the knee replacement at bay.